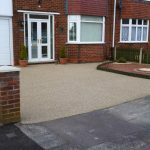 We are not in the job of criticising other companies, installers or works but when we are faced questions about a resin bound driveway odour and staining it does give us the opportunity to highlight how temperamental resin can be! And in the wrong hands this is can be compounded. Just a few opinions as per our conversation of Tuesday 29 March 2016. 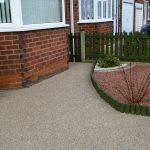 Firstly, you stated that yours and your neighbours resin bound driveways had not only been completed in the winter months which we not normally advocate and in fact the install was in wet conditions. 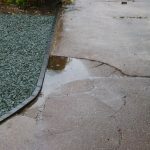 Wet and heavy moisture content do no go with resin based products which should as a rule be laid in temperatures above 5° c and in dry conditions – hence non curing. The fumes we can only think are relevant to the type of resin used. 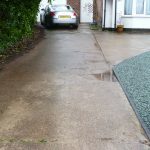 We use a polyurethane product which is totally odour free and best suited to domestic applications but epoxy was the original resin and this may be the reason for the smell. Hope this helps with the issue you have with the installs, but we do recommend returning to your installer for further help”. 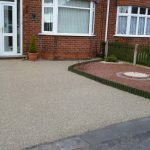 We have been installing residential resin for over 15 years now. 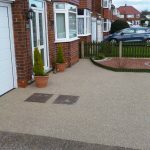 There will always be potential issues with resin due to lack of knowledge for example, poor surface prep, humidity, poor substrate or even incompatible surface – block paving being a good example. Finally, there is always the chance that the resin is defective but with a quality installer and supplier this is not a common occurrence. Feel free to look through our website and view recently completed works. We at Drive-Cote Ltd offer free advice. No salesman just Simon or Faith! 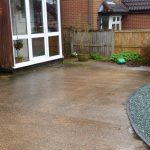 No pressure and free no obligation quotes. 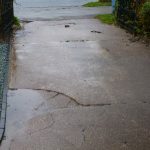 This entry was posted on Sunday, April 24th, 2016 at 10:19 am	and is filed under Block Paving, Chesterfield, Concrete, Derbyshire, Diary of a Mansfield Resin Driveway Company, gardens, Imprinted Concrete, Kirkby in Ashfield, Latest News, Leicestershire. You can follow any responses to this entry through the RSS 2.0 feed. Both comments and pings are currently closed.